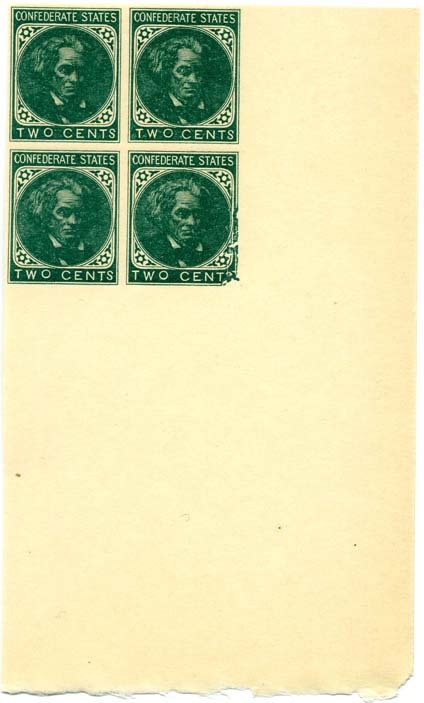 Printers: Thomas De La Rue & Co.
CSA 14, 1¢ orange lower left corner margin copy, unused, no gum, a Gem! 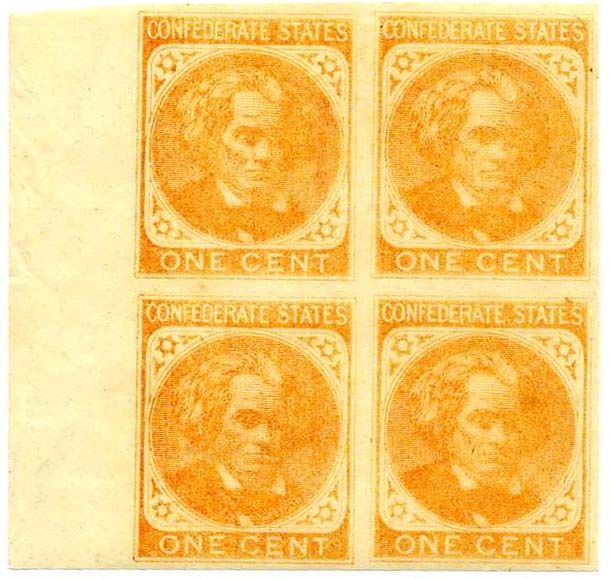 CSA 14, 1¢ orange block of four, original gum, hinge remnant, faint vertical bend on left stamps. $375. 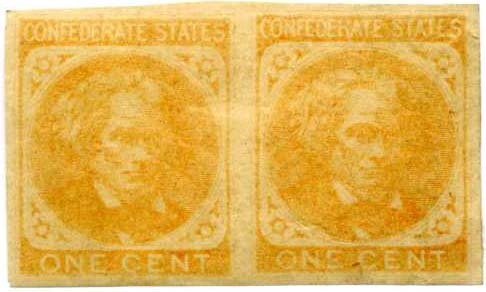 CSA 14, 1¢ orange pair, no gum, slight usual internal wrinkles, nice color, SCV as singles $200. $130. 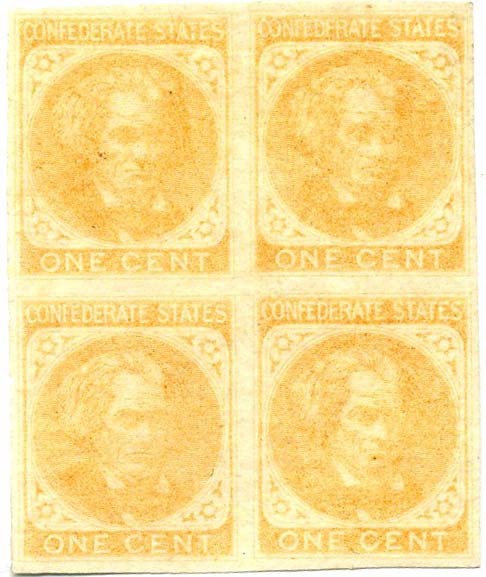 CSA 14a, 1¢ deep orange right sheet margin block of four, full original gum, light gum creases on right vertical pair, very lightly hinged, Pretty! 2013 SCV $520+ and CCV $900 as singles. $700. 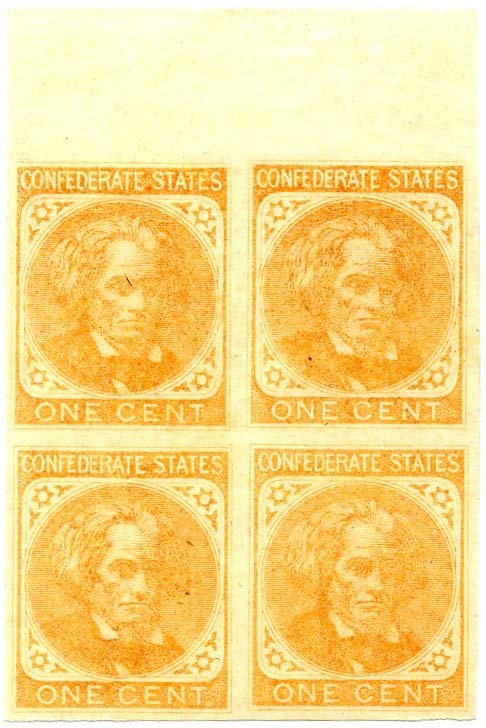 CSA 14a, 1¢ deep orange left sheet margin block of 4, full original gum, almost invisible trace of hinge mark on top two stamps, bottom two stamps never hinged, PFC 446655 for block of 12, Extremely Fine, Nice! 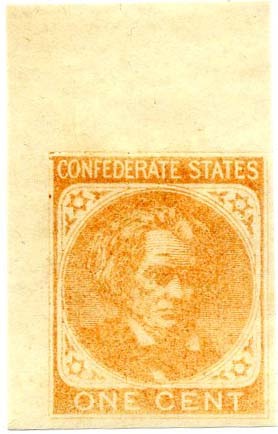 2013 SCV $520 as singles with no premium for NH, CCV $900. $750. 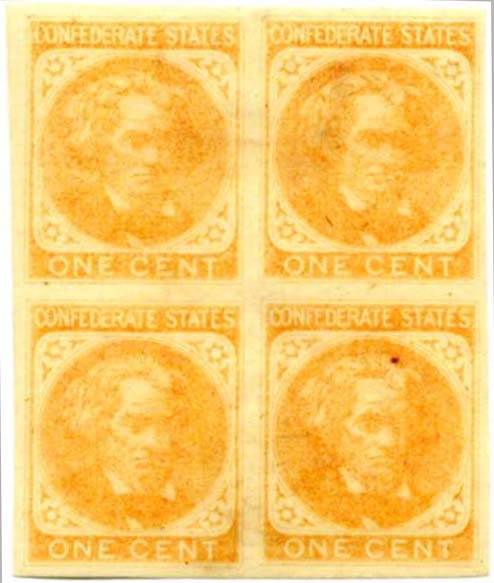 CSA 14a, 1¢ deep orange block of 4, full original gum, never hinged, PFC 446655 for block of 12, Very Fine, Nice! 2013 SCV $520 as singles with no premium for NH, CCV $900. $750. 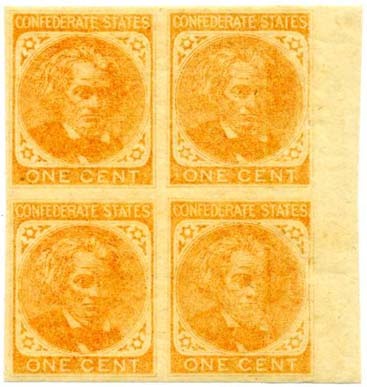 CSA 14a, 1¢ deep orange top sheet margin block of 4, fresh, no gum, SCV $360+ as singles. Wonderful rich color. $450. 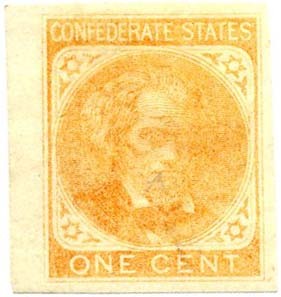 CSA 14a, 1¢ deep orange, never issued, no gum, Very Fine, SCV $140, CCV $225. $140. 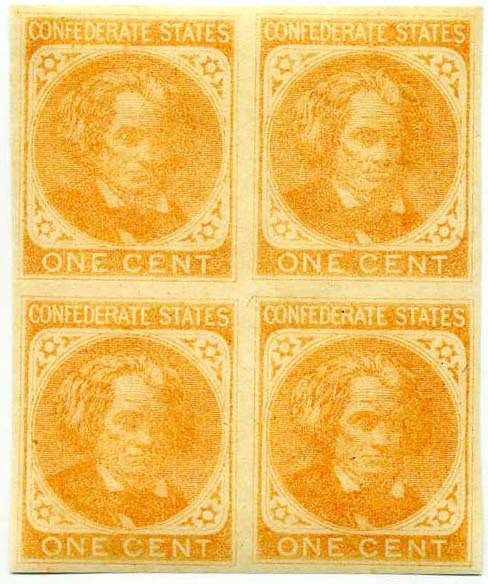 CSA 14, 1¢ orange block of 4, unused, no gum, Very Fine. 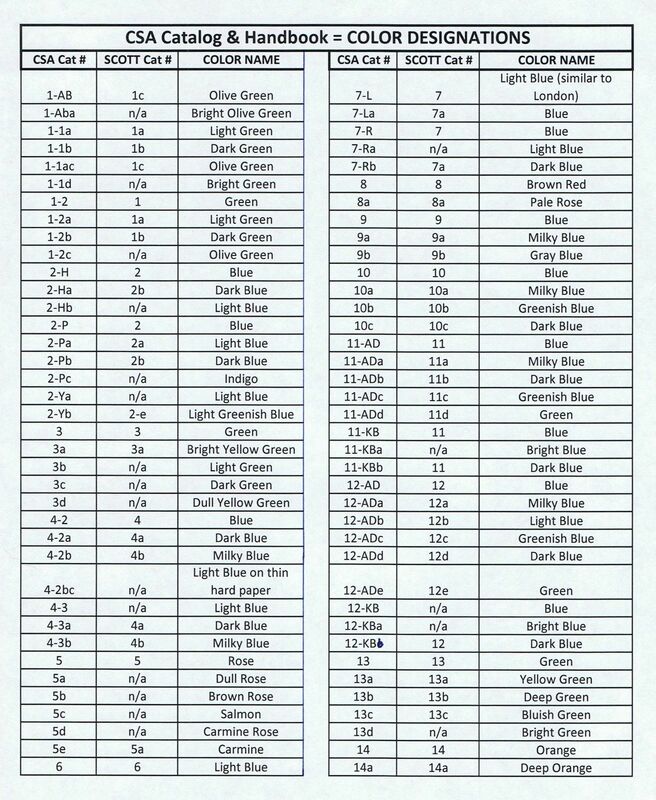 SCV $450 as a block. 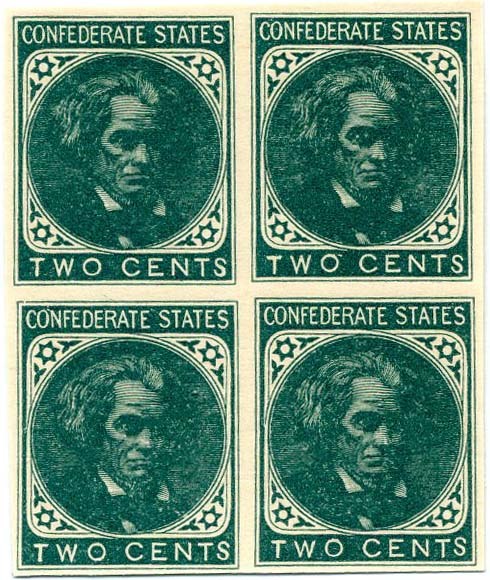 $250. 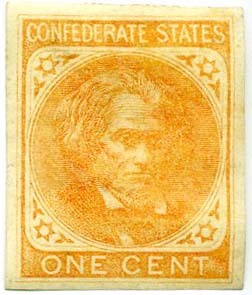 CSA 14a, 1¢ deep orange, fresh with rich color, original gum, heavily hinged, Very Fine, SCV $130. $140. 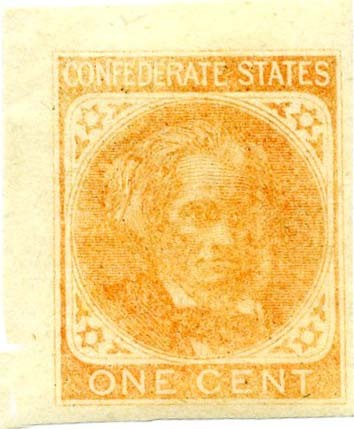 CSA 14a, 1¢ deep orange upper left corner margin single, full original gum, never hinged, Superb. SCV $140+ $300. 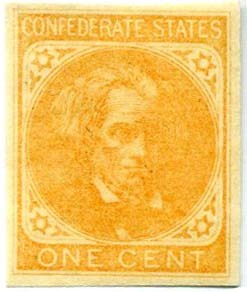 CSA 14, 1¢ orange left sheet margin single, original gum, hinge remnants, great color and impression, fresh, Extremely Fine. $140. 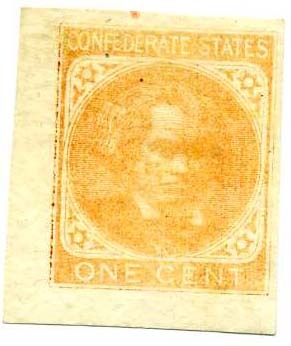 CSA 14, 1¢ orange, upper left corner single, rich shade, ample to huge margins, original gum, never hinged, Very Fine-Superb. $140.